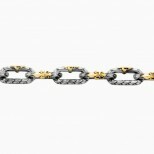 .925 Silver solid chain link bracelet. 18k Gold Fleur de Lis carvings on the sides of each chain link, with an empire style leaf design carved all around each link for an old European aesthetic. Total length is 9.25 inches, width is just over half an inch (15 mm), each link length is just over 1 inch (30mm), and the thickness of each link is 4mm. 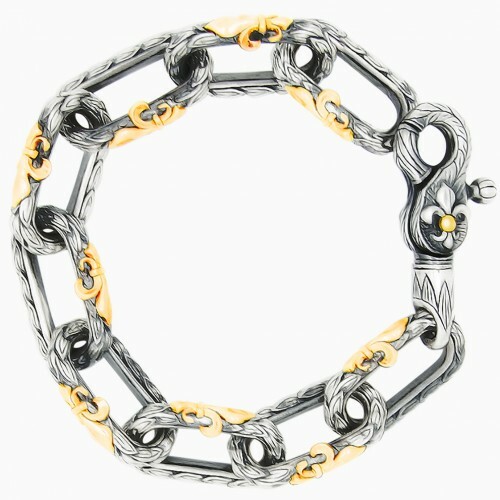 An oxidized and shiny finish on the bracelet and on the clasp. The clasp is also made of .925 silver featuring a Fleur de Lis design on both sides with an 18k gold dot on the Fleur de Lis to give a pop of interest and the ability to wear mixed metals if desired. 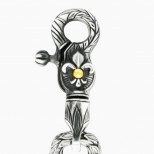 The clasp is also carved in Empire style.